In the mashing phase starch is converted in fermentable sugars by specific enzymes (amylase) present in the malt. A control of the real conversion can be made measuring the residual starch in wort, so that you can continue with the remaining operations. With CDR BeerLab® systems it is possible to obtain reliable results on starch immediately, carrying out the analysis during the mashing phase, directly in brewery. 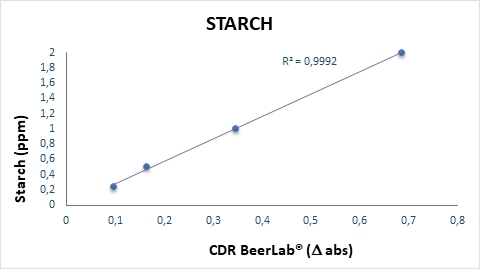 Starch levels can be measured using CDR BeerLab®, a system which enables you to carry out a wide panel of chemical analyses on beer and water, using a single instrument, in a process that is faster and simpler than traditional methods. Starch reacts with a solution of stabilized iodine, producing a violet coloring, measurable at 620 nm in end point. Starch was last modified: February 19th, 2019 by CDR s.r.l.